As good as Europa Universalis IV is , if you're new to Paradox's information dense strategy games, you may be put off by the continued bombardment of stats and figures. And there's little more demoralising for a nation's army than being forced to wait around while there leader learns who they're supposed to be attacking. 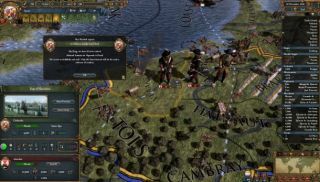 Understanding the benefit of patiently explaining their game, Paradox have released a series of video tutorials meant to get you up to speed. You'll not be taught the more advanced tactics, but if you're a complete beginner - or have yet to delve into deep strategic waters - they should give you an idea of how to get started.